Nepal Telecom published final result of Level 6 and 7 posts after adding written exam and interview marks. The written exam was taken by Lok Sewa Aayog. Post of Level 7 are Telecom Engineer (Electrical), Telecom Engineer (Computer) and Engineer (Architect, Civil). And Post of Level 6 are Assistant Accountant, Assistant Business Officer, Assistant Administrative Officer. 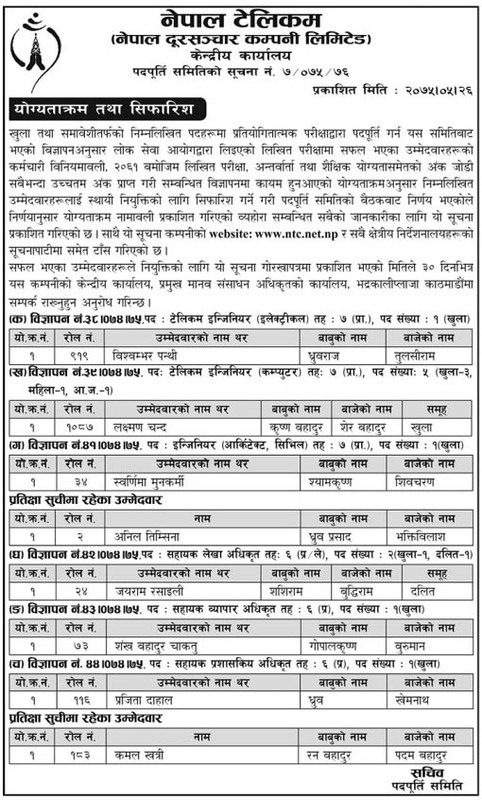 Check Nepal Telecom Result of Level 6 and 7 Posts below.